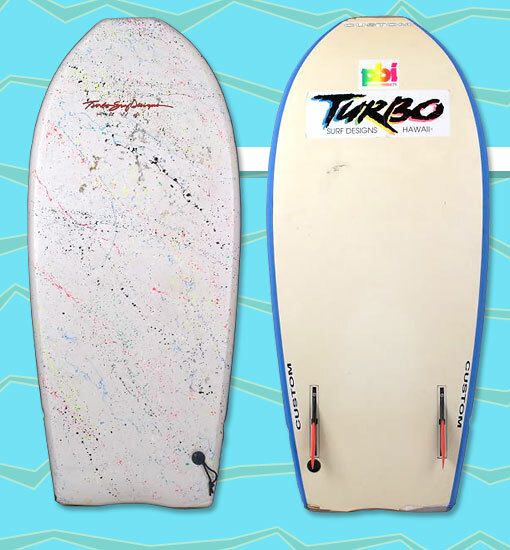 With a length of 48", the Super Turbo was one of the longest bodyboards in the Turbo Surf Designs lineup. Typical of most Turbo boards, the Super Turbo featured graphics on the vinyl deck and standard twin fin boxes. This narrow nose version of this model was also known as "Turbo 2". This later model features an updated logo and leans towards the trend of tamer designs and colors of the 1990s. This particular board has a set of pink-tipped Turbo Vector Flex Fins installed. Photo: Seth McNew.